Take advantage of the warm weather for a sunset dinner on the patio with fine stoneware by Costa Nova. The complementary Porto table runners are 100% stonewashed linen, available in sets of two for $96. 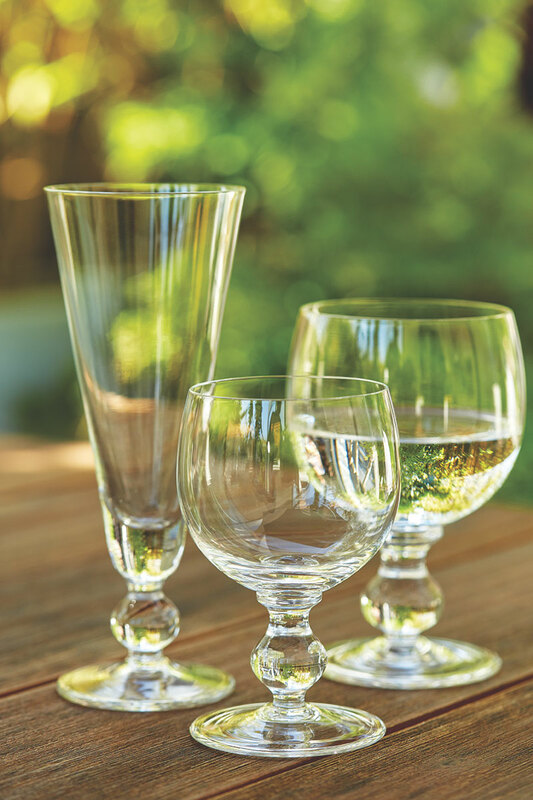 GLASSWARE | The Aroma collection of mouth-blown glassware from Costa Nova comprises a flute ($22), wine glass ($23) and water glass ($24). 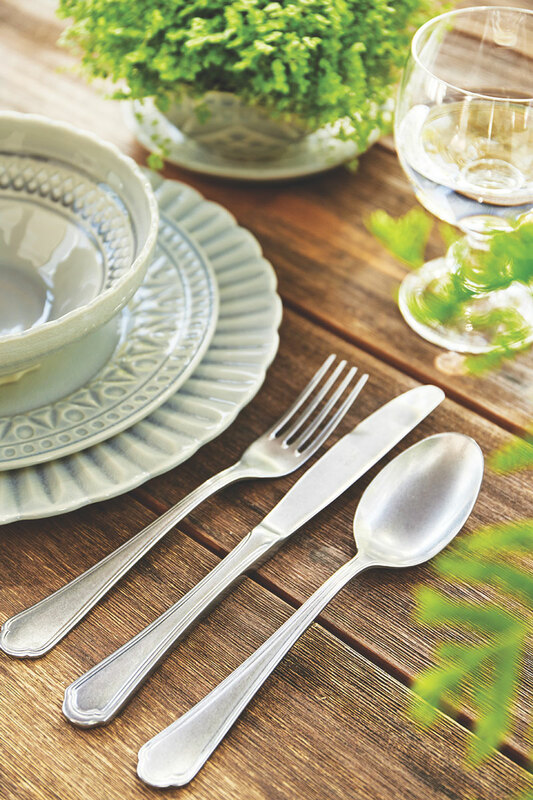 FLATWARE | Lago flatware from Costa Nova complements the table setting. A 20-piece set (four each of knives, forks, spoons, dessert forks and dessert spoons) is $330. 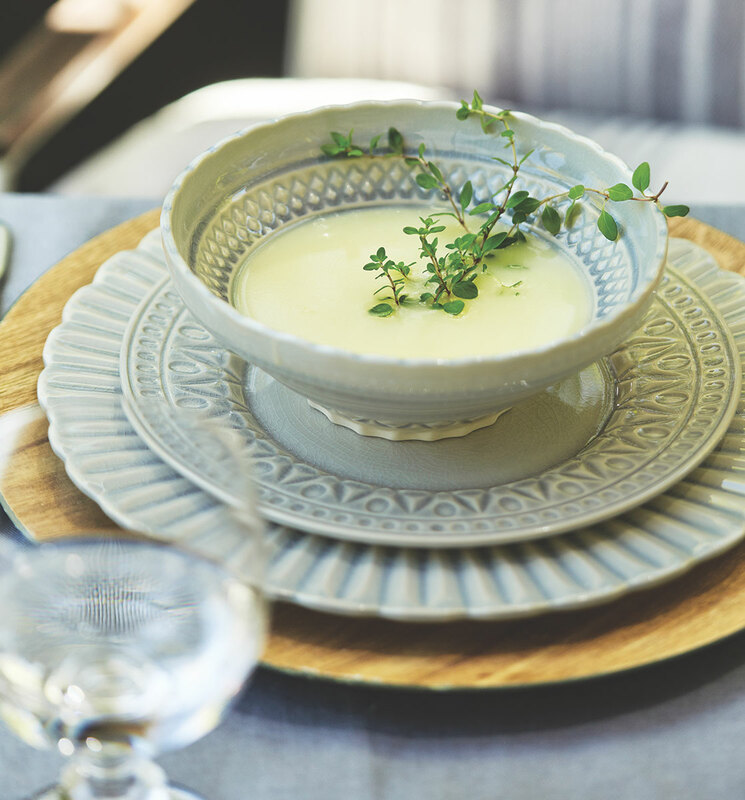 STONEWARE | The Cristal collection includes soup/cereal/fruit bowl (two sizes at $15.50 and $24), salad plate ($24), dinner plate ($26.50) and large serving bowl ($59.50). Boost the elegance in this season of casual living. 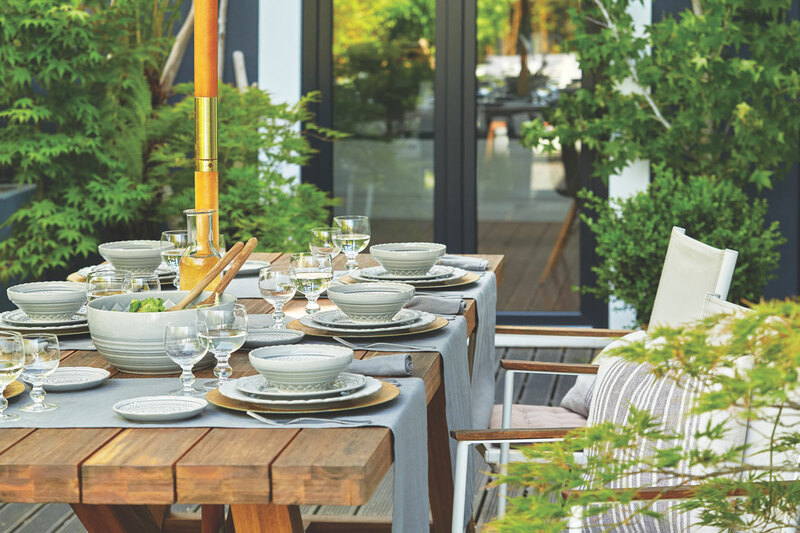 Promise yourself that one evening this summer you will surprise your family—and perhaps yourself—by keeping the plastic stowed in the pantry and setting your picnic table with durable yet elegant stoneware dishes and real glassware for a stylish but fun sunset dinner. Keep the preparation for the meal simple by stacking a bowl, a salad plate and a dinner plate at each place setting ahead of time. Let your “centerpiece” be three big bowls filled with a chilled soup, tossed salad and an entrée such as chili or pasta. For a special treat, set the dinnerware on chargers in a contrasting color. The table setting above features the new Cristal collection of fine stoneware by Costa Nova, named for a small fishing village on the North Atlantic Coast known for its wood houses painted in colorful stripes and for the fresh seafood served daily in the local restaurants. That Mediterranean heritage influences the company’s designs. The Cristal collection itself is inspired by patterns found in fine crystal. Each handcrafted piece is made in a single-firing system heated to 2,160° F, creating a ceramic body with a special bonding between the clay and the glazed surface for durability without compromising color and style. Costa Nova is available at The China Closet and Home Furnishings in Fair Haven, NJ, Garden Cottage in Fairfield and Morristown, NJ, Point Beach Interiors in Point Pleasant Beach, NJ and costa-nova.com.